Son Kee-chung is among the all-time world’s running greats. And he is almost unknown outside of Korea. Why is he so significant? He smashed the existing world record in 1935 for marathon running 2:26:14, beating the previous record which had stood for the previous 10 years. After setting the record in 1935, it stood for another 12 years until one of his trainees set a new time at the Boston Marathon in 1947. 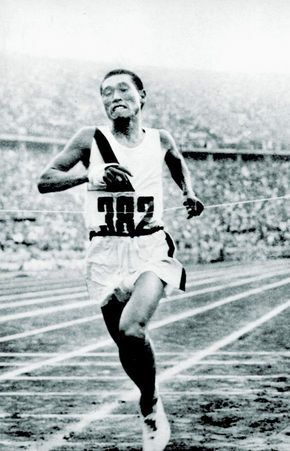 Son Kee-chung is best known for winning the marathon at the 1936 Berlin Olympics where he ran under the Japanese flag because of the colonial annexation of Korea in 1910. Defiantly, at the medal ceremony, Son Kee-chung sought conceal the Japanese flag on his uniform and remains a political act of Korean patriotism that continues to be widely celebrated in Korea. He went on to become an exceptional coach, not only training Suh Yun-bok for his 1947 win, but also ensuring first, second and third places to Korea in the 1950 Boston Marathon, as well as Hwang Young-cho who won gold for South Korea after winning the marathon at the 1982 Barcelona Olympics. His legacy is one of inspiration. Visiting Son Kee-chung’s old primary school in Seoul that has been turned into a Memorial Centre, the Manager summed up Son Kee-chung’s legacy in one word as: “challenge”. The human bridge makes incredible things possible when supported by strong commitment and passion. I will be running the seventh leg of the 10 City Bridge Run here in Seoul on this Sunday at the Son Kee-chung Marathon event. This entry was posted in Inspiration, Korea, Marathon, Son Kee-chung and tagged Inspiration, Korea, Marathon, Son Kee-chung, Stories. The highly respected Coach Bob Williams from Portland, Oregan, developed this program for marathon distance and was written up in Noakes book ‘Lore of Running’. I have modified it slightly for a shorter distance, and built in some rest to avoid overtraining. See the program at the menu at the top of the page here. I invite you to join me on any day I am running. You don’t need to run the same course, or even be in the same city. All you need to do is head out where ever you might be and run the same training load I have for that day. Send me a message by email, or comment below, or post on Facebook so I know you have taken part. You could even send a screen-shot of your mapped course or photo of you out running so others could see as well. Let’s get this conversation started start through running. How many people could join me running on any one day? Two, ten, 100, more? Don’t go it alone: take the office with you. How large a group can you organise? I know there are running clubs that meet regularly- include my load in your distance, then send a photo with your crew out training! I know my good friend John Thuo from Kenya will be keen to help out. 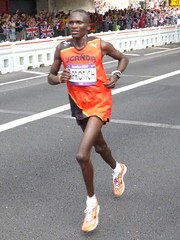 He is a marathon runner and a good one too. And my mate Dean in Sydney has also said he is getting ready to help encourage me along in my training with some of the 8 km routes. That is three of us to start! A number of good friends including Ash and Simon here in Sydney have already stepped forward saying they will run with me on the day itself. Others are of course welcome, and don’t forget there are nine other cities as well. You could even run your own 24 km route during the month I am running on one of the days in solidarity for the cause. Trust me, it will encourage me enormously to know you are out there with me! Please share the opportunity with others and repost this link. Let’s get more people involved. Fire up the network and get this conversation started! So how about you too? Will you join us? Pick an easy day if that is best for you. Just run one day – no big ask. How about 2 January 2013 (scroll down: it is 6 x 200 m ‘sprints’). No prize for coming first, but it is important that you come with us on this journey. This entry was posted in 10 City Bridge Run, Running, Training log and tagged Marathon, Road running, Running. My good mate Will Cummins recently completed the Blackmores Sydney Marathon achieving a personal best time. 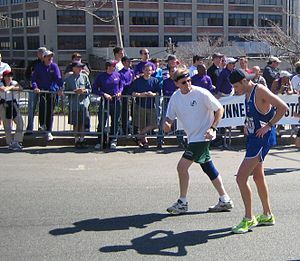 It was his first marathon, and he finished strongly right through to the end. “Absolutely exhausted” were his words to describe his feeling on the completion of the race, spoken with a very satisfied smile across his face. 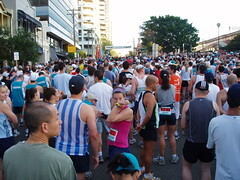 This entry was posted in Inspiration, Marathon, Running and tagged Blackmores Sydney Marathon, Marathon, Running.